Do you have the right equipment for your material handling needs? Pallets can help with organization. Material handling equipment purchases need to be smart, as they can help improve the efficiency of your warehouse. If you’re able to move lots of inventory at a time with ease, you can organize your warehouse quicker, and potentially reduce worker injuries due to strain. However, you need to make sure you’re buying the right products for the job and ensure they’re good quality. According to Material Handling and Logistics, not doing your homework before purchasing pallets for your warehouse may end up costing you more than you initially realized. The news provider reports you need to look at the quality of steel of the pallet rack, as it could affect the overall strength. Additionally, you want to make sure it can sustain the environment you’re buying it for, whether it be a temperature-controlled warehouse or cold storage. Thomas Net reports that pallet racks can help maximize warehouse space. 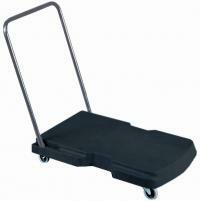 By adding material handling equipment such as pallet jacks and dollies, you can help move inventory around seamlessly. Pallets also make it easier to stack inventory and take advantage of the vertical space of a warehouse. It can make for overall better inventory management. Are you on top of both shipping and receiving? Material handling equipment is increasingly important during the holiday season, as it allows logistics companies to keep control of all the inventory coming in and out of the warehouse at a productive rate. It’s critical to have a well-performing fleet of machinery and equipment, as a break could cause issues throughout the entire supply chain. While many companies have been busy fulfilling deliveries to customers, returns are happening earlier than anticipated this year. According to the Washington Post, while returns typically used to take place after the holiday season, companies are starting to see it inch earlier into December before the season is even over. The news provider reports that this is probably due to the fact that people are shopping earlier and buying more things, which means they’re trying to return things earlier as well. That does not mean companies should only be focusing on fulfilling returns, though. According to Fortune, people shopping the final Saturday before Christmas may actually overtake Black Friday in terms of sales, so there is still a demand for products to come into stores and out of the warehouse. Having strong shipping and receiving operations is critical for overall success for the holiday shopping season. Equipment can be used to offset the labor shortage. Are you using material handling equipment to keep your warehouse moving efficiently? Equipment is a great way to move a lot of inventory at once, particularly bulk inventory that’s heavy, and be stacked and loaded onto dollies and lifts and taken to the next phase of the supply chain. This can also help reduce the number of injured workers who strain themselves on the job. According to Manufacturing.net, buying material handling equipment that can reach various parts of the warehouse and balance different amounts of inventory can go a long way in improving warehouse efficiency. If you’re able to get equipment that is easy to stack, you can fit more inventory on top of one another and move it seamlessly. Additionally, the news source reports that this is an easy way to reduce the number of trips needed to get from point A to point B. In addition to wanting to maintain an efficient operation, equipment also helps offset the labor shortage. Industry Week reports that there continues to be a skills gap in the manufacturing sector, and it’s only getting larger as different messages surrounding the sector discourage potential applicants from pursuing a career in the field. In the material handling sector you need to continuously be making improvements to your supply chain. Continuously inspecting and buying new equipment to make sure everything runs smoothly is one step, but you should also be assessing your overall operations and seeing where you can make adjustments. One area of investment you will want to look into is technology, according to Material Handling and Logistics. According to the news source, in an effort to stay competitive when recruiting top talent, you need to have top-of-the line technology. This can also help offset any gaps you have due to labor shortage, as software platforms and robotics are starting to fill in with some of the more monotonous tasks. Additionally, investing in technology can help you gain more insight into what is going on with your supply chain and where you can make efficiency improvements. According to Supply Chain 24/7, more managers are using technology to have insight into how quickly moves through the supply chain and spot signs for needed improvement. The news provider reports that managers are taking a look at aggregate data across the chain and trying to make improvement in delivery productivity and seeing peak times for activity. Plan ahead what inventory you want to highlight this season. As the holiday shopping season moves into high gear, many organizations are finding they need to be prepared for round-the-clock demand, as consumers aren’t just leaving their shopping for the traditional Thanksgiving weekend. Instead, brands are offering discounts throughout the entire shopping season. The Washington Post reports that economists have been predicting huge sales drivers thanks to a burgeoning economy and consumer confidence. In order to capitalize on it, retailers are offering discounts throughout the whole season so people will continue to shop. The news provider reports that although there was a slight dip in the number of shoppers year over year, experts in part believe it’s due to the prolonged shopping season. However, with much larger demand and a wider timeframe, it’s critical that managers stay on top of inventory as the season continues. Business.com reports that for small businesses in particular, this is a time to make sure your unique products are being highlighted to customers. The news provider reports that because smaller shops typically have dollies filled with unique, high-quality items, it’s important to highlight those. Additionally, small business managers may want to look at local events happening and see if it makes sense to fill material handling equipment with inventory to sell their wares there. Do you find that costs have become a significant burden to your supply chain? It’s possible to be more efficient with your material handling operations in order to get a better grip on costs. That could mean making more up front investments, such as buying better material handling equipment to move inventory in an efficient manner and hiring top talent to execute your vision. Thomas reports there are a number of ways to reign in costs on the material handling front. For starters, trying to be efficient with your space can go a long way. The news provider reports wasted space in a warehouse could mean more overhead costs, while an overcrowded warehouse could put employee safety in jeopardy. It’s important to do forecasting to determine how busy your warehouse could be at any given time, and determine what your optimal inventory levels are. Try to set a goal and keep levels at that rate. Reliable Plant suggests trying to plan as much as possible and then set standards for the kinds of material handling equipment you want, how you’ll go about storing it and what processes need to be in place. A plan can help you see the gaps in efficiencies and help you determine what needs to be done to close them. With the holidays kicking into high gear, it’s a critical time to have your material handling equipment ready to go and in good condition, so you’re able to run lots of inventory in and out of the warehouse to fulfill customer purchases. According to Material Handling and Logistics, it’s important to have your warehouse ready to go, as an estimated 71 percent of American consumers plan to either head to the stores or shop online during the Thanksgiving holiday weekend, including Cyber Monday. This means you need to have streamlined operations in your storefronts, backrooms, warehouses and distribution centers in order to fulfill all the demand. It’s also important to offer deals in order to stay competitive. The news provider points out that some retailers are offering their weekend promotions early in order to get foot traffic moving before the holiday weekend even hits. However, Retail Dive reports that Cyber Monday is expected to be the big draw for the holiday shopping weekend, with the majority of dollars being spent on that day both online and in-store. If you have a multi-channel operation, it’s important to do as much forecasting as possible to plan to be smartly stocked both for online and in-store orders.